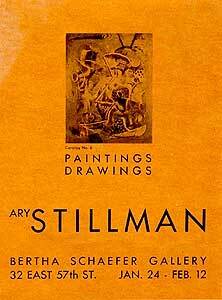 "...It was in the fall of 1947 or perhaps the spring of 1948 that Bertha Schaefer opened her gallery on 57th Street. She had been widely known for years as an interior decorator, but for some time she had been eager to widen the scope of her work and to gather around her a group of representative painters. She wanted to advance the idea that one shouldn't choose a painting to fit in with the decor of a room, that one should choose a painting or paintings he or she would want to live with, and then build the tone of the room around the painting or paintings. She talked with Ary about this a number of times  they had been friends for years  and when she was prepared to exhibit her first group show she asked Ary to send in a painting. Milton Avery was in that show I recall, and Will Barnet, Ben Zion, Sue Fuller, Ary and others I can't remember. From this came a continued association for Ary with Bertha's gallery  many group shows, and a series of five one-man shows, beginning in February 1949 through 1954, until we left New York for Paris..."
"Ary Stillman is perhaps one of our most serious and patient researchers in the field of abstract painting, and one feels keenly that exploratory esthetic sense in each of the oil paintings and drawings in his current exhibition at the Bertha Schaefer Gallery. "I use colors like a composer uses musical notes," he says, and although he has no actual system of color-and-sound counterparts, as some extreme theorists have attempted, Stillmans paintings do remind one of the emotional overtones of certain musical compositions. He began his new direction about three years ago, and considerable clarification and force have been acquired since. "House And Cliff," and "Three Figures" are evocative works when you have absorbed them sufficiently; and the drawings and small gouaches are especially eloquent." "Each painting is an experience of a different kind: explains Ary Stillman of his new work at the Bertha Schaefer Galleries. Surely that is the main impression. 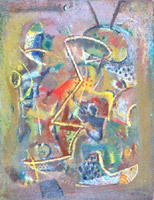 As non-objective expressions of melodic color, there is little repetition either in space elements or emotional impact. Like dreams, each canvas takes different form, and also like dreams, Stillman concerns himself with inner reality rather than surface ideas. New World, the largest painting in the group, is fiery in reds and warm tones; "Ritual," suggestive of some animal form, is of yellows and blues and flowing lines against spatial areas which are well-contained within the canvas. One of the most interesting, "Hieroglyphic," seems a Talmudic theme in which violet and white notes combine with more definite patterns. Six or seven "drawings" add, as well as lead, to the significance of these thought-provoking paintings; they are as finished as the oils, and as texturally complete." "When Ary Stillman so arbitrarily changed his style a few years ago from those provocative, airy interiors to unfathomable non-objectivity, his followers were not only disconcerted but utterly confounded by the change, lacking cohesive organization and purpose as it then seemed. The canvases did have a certain beauty, for Stillman has the gift of color. But then pigment in itself has an intrinsic quality of beauty, though it offers nothing more than eye pleasure, and that was all that could be said of Stillmans paintings. Now after three years absence he appears at the Bertha Schaefer Gallery with a collection of paintings that more than justifies the change in style. In the interval a compromise has been made. Fundamentally still abstract, the painting is now builded around a definite form of reality, fugitive as an after image though it may be. Elusive as the figure of the "Goosgirl" is, emerging from a background of subtly manipulated minor notes brilliantly accented, that figure recaptures the very essence of Japanese figure painting. Stillman not only has found himself, but has something to say that will be heard." "Ary Stillman's latest exhibition of abstract paintings at Bertha Schaefer Gallery shows progress and sensitivity in a non-representational linear handwriting. 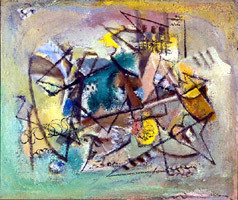 Since his last show Stillman has clarified his compositions considerably and simplified his main movements. The work is still somewhat eclectic, with the evidences of some John Marin's and Jackson Pollock's mannerisms not always assimilated. But expression is generally less ornamented and more decisive than heretofore, and the soft, melting colors newly introduced have a lyric intensity."